Tim Hotle, a 12-year veteran of the Albuquerque Police Department, in sworn testimony this week undercut federal authorities’ long-running narrative about a controversial 2016 law enforcement operation that snatched up disproportionate numbers of blacks and Hispanics. 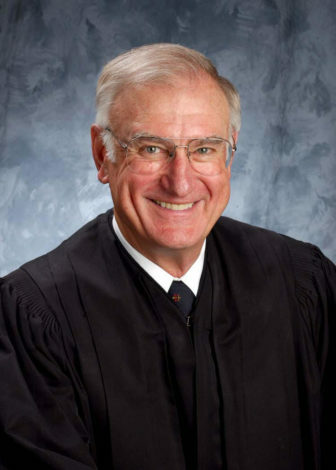 During his 45 minutes or so on the witness stand, Hotle told U.S. Senior District Judge James Parker that as a representative of APD he had helped plan the Albuquerque operation pushed by the U.S. Bureau of Alcohol, Tobacco, Firearms and Explosives (ATF) and the local U.S. Attorney’s Office. Authorities have repeatedly contended they arrested “the worst of the worst,” and a summary report of the operation stated that its goal was to infiltrate drug trafficking organizations “facilitated by” Mexican cartels. Most of the 103 people arrested, however, were picked up for their involvement in small-quantity drug sales; few had the types of violent criminal histories authorities said they were going after. Hotle’s testimony further undermined the federal government’s claims. Albuquerque at the time was experiencing a dramatic rise in violent crime, and the city’s number of sworn officers had dipped significantly below a high of nearly 1,100 in the late 2000s. Hotle said the notion of targeting individuals with ties to Mexican drug cartels “never came up” during three meetings with out-of-town ATF agents in early 2016. 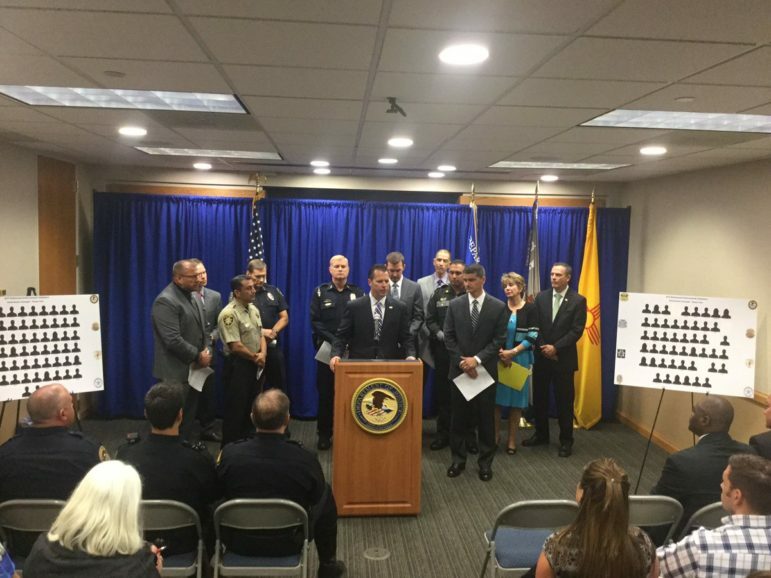 Hotle, who had only recently been assigned to a joint APD-ATF task force, attended the meetings to help plan what would become a highly controversial undercover sting operation aimed at drug and gun crimes in Albuquerque that ran from April through August of that year. Hotle’s comments came Tuesday afternoon, at the end of a contentious two-day hearing over what role race played as agents and their informants chose targets in the operation. And they directly contradicted how authorities have characterized the goals and results of the operation for years. The “worst of the worst” narrative began at a news conference in August 2016, when then-U.S. Attorney Damon Martinez and others touted the operation’s unqualified success. They’d taken more than 20 pounds of drugs and more than 100 firearms off Albuquerque’s crime-ridden streets; they’d arrested 103 people, the officials said. That storyline continued in April 2017, when ATF Special Agent Russell Johnson testified before Judge Parker that his team pursued and arrested people with violent criminal histories and prominence in the city’s drug and illicit gun underworld. The purpose of this week’s hearing was for Parker to hear testimony on whether drug and gun charges against 46-year-old Yusef Casanova should be dismissed because ATF singled him out for investigation and arrest based on his race. Casanova was one of 28 black people nabbed in the sting — part of a glaring racial disparity among those ATF arrested that NMID has explored at length in dozens of stories during the past two years. Blacks were highly overrepresented as targets in the sting, compared to their share of the city’s population — 3 percent — and the number of black people prosecuted for gun and drug crimes in federal court here during a recent 10-year period. Hispanics were overrepresented, too, while white people were drastically underrepresented. Casanova has a lengthy criminal history that includes some violent crimes. And it is not in dispute that he brokered the sale of less than an ounce of methamphetamine and a shotgun to an undercover ATF agent. But his legal team believes there’s enough evidence that ATF engaged in racial profiling to dismiss the charges based on a claim of “selective enforcement” because agents did not pursue whites with the same zeal as they appeared to go after blacks. In Casanova’s case, a white man gave him nearly an ounce of meth to sell to an undercover agent. ATF’s minimal effort to identify the white supplier turned up nothing, and the man was never arrested. Another previously hidden aspect of the defense lawyers’ case emerged during this week’s hearing. After Parker ordered government prosecutors to turn over additional information last year, the defense team was able to compile a list of people agents had probable cause to arrest during the operation, but, for various reasons, did not. The list sheds new light on who ATF and its team of confidential informants were pursuing during the operation. The figures, broken down by race and ethnicity, almost exactly mirrored the rates at which whites, blacks and Hispanics were arrested in the operation, according to a document admitted as evidence on Tuesday and obtained by NMID. In all, ATF could have arrested 61 more people in the operation. 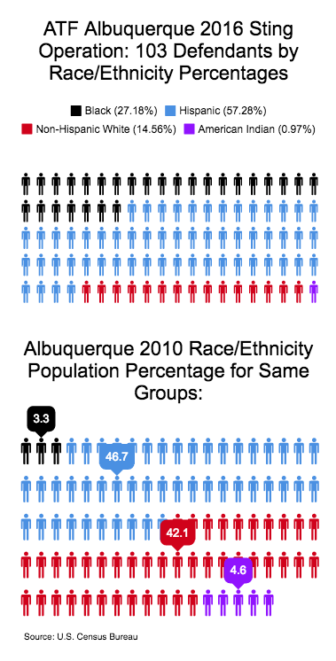 Fifteen percent of them were white — a significant underrepresentation when compared to Albuquerque’s white population. Hispanics made up 46 percent of those investigated but not arrested, and black people accounted for 26 percent — both over-representations compared to population. Hotle, the APD officer who worked closely with ATF on the operation, said race was never a part of any discussions when law enforcement was discussing how to carry out the operation. But he acknowledged that an operation meant to take down kingpins and major players in the narcotics and gun trades are time consuming, “complex” and generally take far longer than the four months ATF spent on the Albuquerque operation. Judge Parker did not rule from the bench on Casanova’s motion to dismiss the charges, and he is under no mandated time constraints to do so. “I will try to make a decision promptly,” he said. A federal judge has denied an Albuquerque black man’s request to dismiss methamphetamine trafficking and gun charges based on his claim that agents targeted him because of his race during a monthslong undercover sting operation in 2016. In a 15-page order issued Feb.